I moved a lot during my lifetime: growing up, in college and life after. Very few of my friends have made the journey with me. Most of them left me because of moving, crazy circumstances or fights. I am lucky enough to have new friends that mean just as much to me as if I had met them when I was two. But there are two that have known me forever (hey, Amanda) whom I care for deeply and today, I spent an hour with one of them. 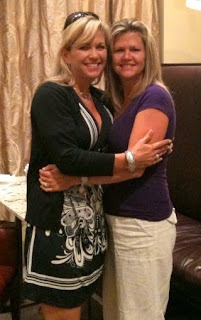 I have known her since I was thirteen and we have lived through failed marriages, births and death. I treasure knowing her and am lucky to have her even if we only see each other once in a blue moon. Our combined age is 79 and I am not telling who is older by six months. The point of my rambling about how much I love my friend is that it is ALWAYS important to take the ones you love; family, new friends and friends who have been around a lifetime, and embrace them. Love them. They are important. Don't forget it. great post..old, dear friends who love and don't judge..there really isn't much better in the world than being truly known and truly loved. A gift for all! Great picture of the two of you. Both of you? Cute as can be. Just cute as can be.